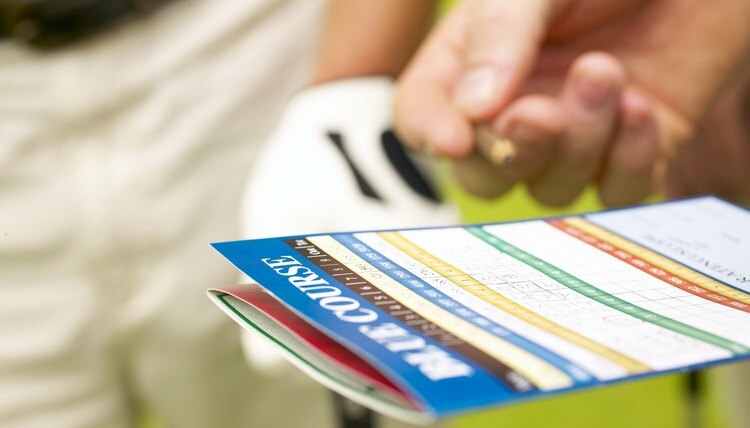 Collect as many scorecards as possible to calculate your average golf score. For many golfers, figuring out their handicap by hand is a confusing and time-consuming process. Instead, some players prefer to use their average score as a measurement of their skill on the course. Thus, instead of a golfer saying his handicap is 18, he might say he usually scores around 90. Gather as many scorecards from past games as possible. If you want to know your specific average score for one given course, use only the scorecards from that course. Ensure each scorecard is complete and that you finished all 18 holes. Use a calculator to add each of the scores on the scorecards. For example, if you have four scorecards with scores of 88, 89, 92 and 94, add these numbers together. In this example, the total number is 363. Divide the total number by the number of scorecards you used previously. In the above example, 363 divided by four scorecards is 90.75, which you can round up to 91. Therefore, your average golf score is 91.